My first exposure to computers goes back to 1970 or so. A computer at that time was something housed in a glass room deep in the basement of a hall at Providence College. The only communication a mere student had with the computer, at prearranged time blocks, was through a cardpunch machine in a corridor outside the Computer Room (unless you broke in – that’s another story). Let’s leave that tale for another time and jet forward to 2011 when a computer now looks as much like a Univac as a MP3 player looks like a Victrola. My home desktop supports the typical PC: tower case by HP (shiny ebony plastic with soft pewter trim) and an Acer 21” flat screen LCD monitor. It’s great for shopping, banking, writing, and research. But, I will not sit at the computer to watch a movie, listen to music and old time radio shows, or read an online book. I like to do those things in bed or in a comfortable living room chair or even at my lunch stool in the kitchen. I eventually got a Kindle (first generation) a couple of years ago. That really helped take care of reading online books. Then I discovered the iPod Touch. It did all the things the iPhone did except make telephone calls and as a bonus there was no hefty monthly fee. Before I could decide to part with the $200 Apple pulled a fast one and came out the iPad. Now my sights were set even higher. I voluntarily opted out of receiving a birthday gift and let ‘she who must be obeyed’ (my wife) know that Christmas would be a really good time to give an iPad to someone. The plan worked! The lady of the house, assisted by my children and their better halves, presented me with a new iPad (16G, my ham radio call sign engraved on the back) for Christmas. That’s when I began my “App Education”. I suspect that you already know that an app is a computer application that runs on a smartphone such as the iPhone. 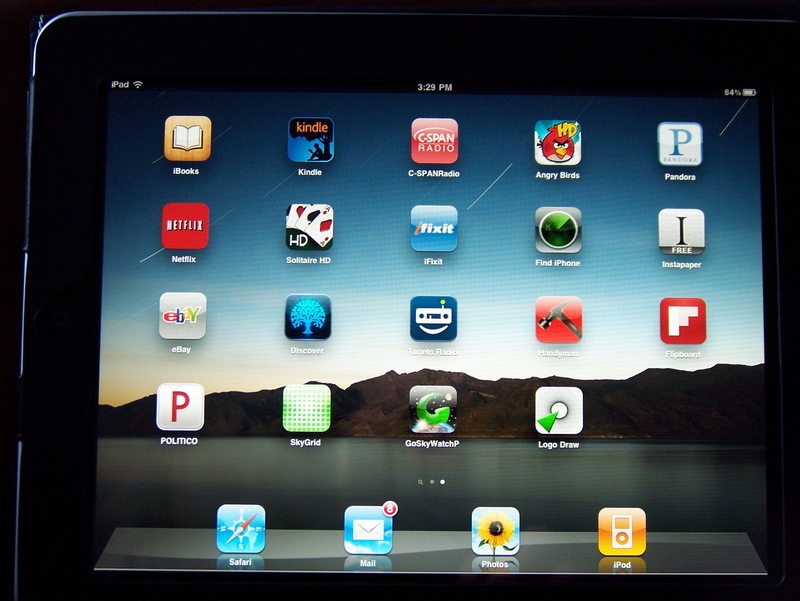 The same or similar apps that run on the iPhone are available for the newly introduced iPad tablet-style computer. (By the way, the iPad is small enough to take to bed, breakfast, or any nearby easy chair.) This little device works so well that I felt that I must share with you some of the apps that I have selected from a field of over 300,000. My interests are somewhat broad but they do tend to stray towards politics and science quite often. I hope there is at least one app here that you don’t already know about! I really love to listen to C-SPAN radio in the morning and its related show, Book TV, on Saturdays. Unfortunately I lost mobile access to the C-SPAN radio shows when my wife and I gave up Satellite radio due to fees of about $200 per year. Now I can listen to four different C-SPAN radio feeds and a huge library of podcasts any time I want with the free C-SPANRadio app. The audio will even run in the background while I am using some other app. It sounds great and educates! Politico is an Arlington, VA-based news outlet that covers the political news out of Washington. It first came about as a result of the 2008 election. News on the Politico app is presented in a magazine format that is easily maneuvered and provides plenty of content including photos. Advertisements are present but not obtrusive. There is no fee for the app. Flipboard is one of my favorites. This is a magazine app with a twist. It has a Contents page that allows you to subscribe to a number of magazine-format presentations and quickly go to them from the Flipboard main page. It also creates magazines from social networking sites that you already have an account on such as Flickr, Facebook, and Twitter. The Twitter section is especially well done. Each tweet appears as a magazine article with portions of links already opened rather than just listed in the tweet. Once you see this you may want to make Flipboard your primary access point for Twitter and other sites. The iBooks app and the Kindle Reader app are two great ways to obtain digital books and to read them. I already had a Kindle and an Amazon.com account. As a result every book that I had registered at Amazon was already available on the iPad Kindle app as soon as I input my account information. Now I have the choice of reading a Kindle book on either device. The iBooks reader links right to the Apple iStore where you can purchase books. Many of them are free just as at Amazon. Also, iBooks has its own PDF reader that works really well. You can download a PDF document from anywhere on the web directly into your iBooks library. The PDF’s look great! They can be resized easily without any loss of resolution and they are often complete with active links in the table of contents. You also get other accessories such as a dictionary. Handyman Magazine and iFixit are two neat items for the Do It Yourself types. Handyman gives you complete access to the four most recent editions of the magazine. The graphics are high quality and the variety of DIY articles is just what Harry Homeowner ordered. For something completely different you might try iFixit. This is a compendium of articles about Apple Computers (2e, iMac, etc.). The articles explain how to take them apart and repair them. You won’t find every answer you are looking for but this is a great place to start. Pandora is a music site that many are already familiar with. The iPad app from Pandora preserves the radio station format and allows you to listen to your stations for hours. Advertisements come up infrequently (no more than one per hour in my experience). This is a great app to provide you with background music while you are reading one of those iLibrary iBooks. Tunein Radio is much like the similar feature that came with my Roku computer-to-TV interface. You can listen in to almost any radio station that has a web presence. The choices can be presented by genre, country, city, etc. I love to listen to talk radio and old time radio shows with this application. Tunein Radio is now my primary source for anytime listening. It evens lets you build a stable of favorites for quick access (cost: 99 cents). Another news reader that I like is SkyGrid. This app presents all the news on the Internet in an easily searchable format so you can read just what you want without having to look far. For instance, I just chose “Categories” from its menu (Featured, Following, Categories, Search, Share App, Shared) and selected “Science & Tech”. Some of the articles that turned up on the listing were: iPhone App Video Review: Flying Hamster; Comfortable in the world: ereaders vs. tablets; Apple’s Jobs takes 3rd medical leave, stock slumps. It is a bit skewed to news surrounding Apple, but then you can do searches too. GoSkyWatch Planetarium, version 4.3.0, takes full advantage of the positioning ability of the iPad. With this app you can aim the iPad at any celestial body and the program will tell you what you are looking at. The reverse is also true. Say you want to find Mars. Just click on the Finder, choose Mars and what looks like a rifle sight will appear in the middle of the screen. You then maneuver an arrow that projects from the sight until the target celestial body (Mars in this case) is inside the site circle. Your iPad is now pointing directly at Mars. Incredible! That is only the beginning of all the amazing things this free application (free, can you believe it?) can do. You have to see and use it to really appreciate how clever this is. I’m not a big game player but there are two that I have spent some quality time with on the iPad. One is called Angry Birds. The object of the game is to put these chatty birds in a big slingshot and knock down pigs who are in their little brick houses. This one will leave lots of fingertip trails on your iPad screen. It’s almost like eating potato chips. The other addicting game I sometimes play is Solitaire HD. This one is very much like the Solitaire found on most PC’s with Microsoft operating systems. Between these two games you will be able to waste plenty of time. One of the first computer languages I experimented with was Logo. I used a version that was available for the old TI-99 computer (back in the ‘80’s). This amazing program is great for learning computing logic as you write commands that move a pencil-toting turtle (represented by a triangle) around the screen. I wondered if there was a version for the iPad. It took about 10 seconds to find it in the app store under the title of Logo Draw. I have not tried it yet but from the description and command list I can already tell that it is going to be a winner. 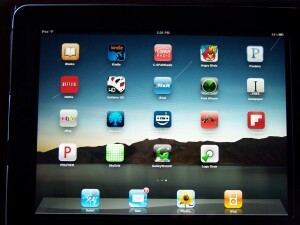 The iPad comes with its own browser (Safari), Mail application, Photo application, and sound/music application (iPod). These also will keep you busy for hours. This entry was posted in Modern Technology, Occasional Commentary and tagged Apple, apps, C-SPAN, computer, FlipBoard, iPad, review. Bookmark the permalink.